... and accompany us to your first day at sea. 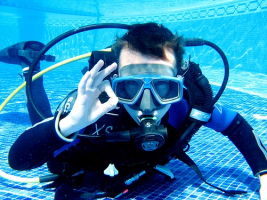 Learning to dive is not that difficult and it is a new experience for everyone! In Gran Canaria you can discover the underwater world in just one day. You do not need experience with our guides and instructors you can enjoy the underwater world with total safety. We pick you up at your hotel in the morning and start the adventure with a theory class in our dive center. We continue with a practical class in the fully equipped pool. We will practice some safety exercises and the use of diving equipment. After a break with a sandwich and drinks included we are ready to go diving in the sea: Let's dive in Gran Canaria! We will go to one of the best diving areas of Gran Canaria and together with our guides and instructors you will enjoy the world of diving in a dive of 30 or 40 minutes with maximum depth of 10 meters (For children with 10/11 years maximum depth of 5 meters). We wait for you! Contents: Theory, practices in the pool, a dive in the sea, rental equipment, diving insurance, snacks / drinks, hotel pick-up / drop-off. The OPEN WATER DIVER / CMAS * course is the first complete course that ends with an international certification as a recreational diver. It allows you to dive around the world to a depth of 20 meters (the depth for children varies depending on their age). While the course we did 2 diving lessons in the pool, 5 dives in the sea and of course diving theory. Conditions: 10 years, NO experience. We go out with divers who already have the Open Water Diver or higher qualification to do two dives in the sea. 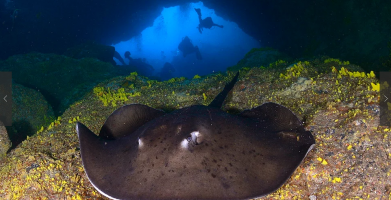 We will go to one of the best diving areas of Gran Canaria and together with our guides and instructors you will enjoy the world of diving in Gran Canaria on two dives. The dive sites always depend on the conditions of the sea and the experience of the diver.